This morning, while making the two-hour drive across country to Palestine, I was filled with anticipation of four days to paint, read, reflect, write, catch up on grading, and enjoy the quiet. I love the basement apartment of the Redlands Hotel where I can hear the hourly tolling of the church bells across the street while I try to paint the facade of Sacred Heart Catholic Church. I enjoy opening the blinds and looking up through the basement windows at that enormous church towering above me. Today I divided my time between the apartment and the Gallery at Redlands upstairs, and am happy to see the church watercolor progressing. If all goes well, I should be finishing this by the weekend. I cannot conceive of a better schedule than I know at this time. My college classes are Monday and Wednesday, and when the urge strikes, I can light out for the countryside and enjoy life in a smaller town than the one where I live. The friends I’ve made in Palestine have enriched me beyond description, and I actually feel a part of this community. The gallery space is beautiful and well-lighted, and the downstairs studio is spacious with that special “monastic” feel. Having read the first fifty pages of Hannah Arendt’s Live of the Mind, I’m feeling a connection with another writer that I seldom feel. My art seems to take on added life when I am able to withdraw from the mainstream of activity and carve out a quiet space for creative pursuits. Thus, the lived experience of the length of a year changes radically throughout our life. A year that to a five-year-old constitutes a full fifth of his existence must seem much longer than when it will constitute a mere twentieth or thirtieth of his time on earth. We all know how the years revolve quicker and quicker as we get older, until, with the approach of old age, they slow down again because we begin to measure them against the psychologically and somatically anticipated date of our departure. Well . 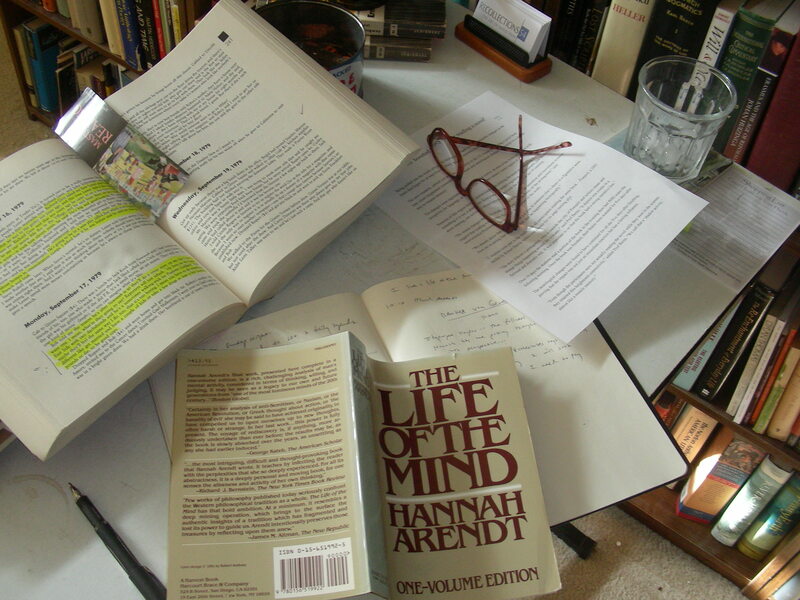 . . all I can say in response to Hannah Arendt is that 2013 is a blur to me. I wish I could believe that that is a sign that I have of many more years to live. To me, the calendar year has not slowed down since my twenties. Perhaps I will feel anxiety in the event that my years begin slowing down! Oh well, I choose not to dwell on that today. I wish I had something more profound to offer my readers this New Year’s Eve, as I have read so many extraordinary blog posts today capping the old year and opening the new. I have given this day to reading, journaling, cooking and house-tidying. 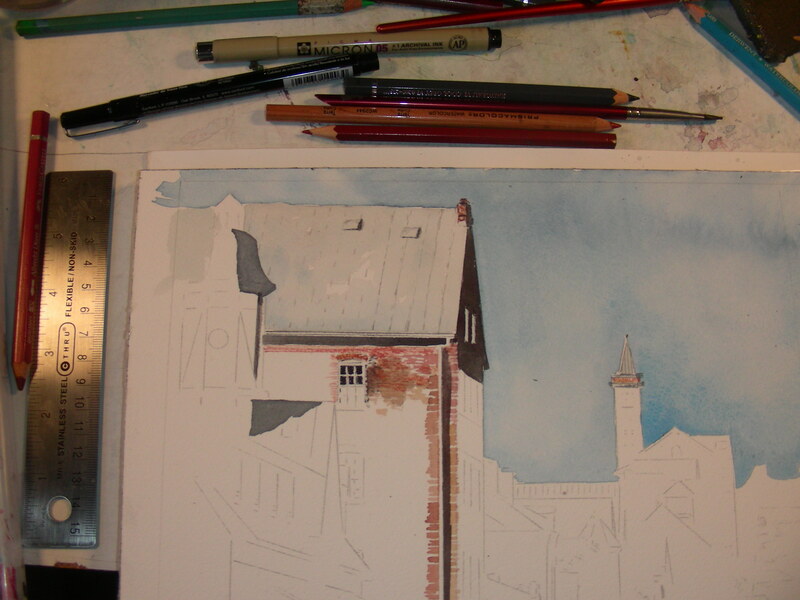 And I have begun another 8 x 10″ watercolor of the historic district in Hermann, Missouri. I have wanted to visit this German town ever since I read William Least Heat-Moon’s River-Horse. Throughout the recent years, patrons have visited my booth during art festivals and asked me if I had any paintings from Hermann, Missouri. The answer was always No, because I had never visited the place. This Christmas, I included Hermann in my Missouri visitations. The winter day was extremely cold, but the sun was bright, the 10:00 a.m. hour was perfect for shadows and light, and I took over forty photos. This watercolor sketch is my first attempt, and so far I like what is emerging. Hence, I am fulfilling my #1 Resolution for 2014 to paint my way into the new year. I cannot express to readers visiting and commenting on my site how grateful I am for all the encouragement you have provided. Makng art is a solitary enterprise, but blogging has definitely taken away any semblance of loneliness from this venture. Thank you for that. I wish you a fabulous 2014. Perhaps tomorrow I’ll begin sharing Resolutions. Thanks always for reading. I wish you a fulfilling night of anticipation. Bob told me the reason he’s after Newsweek is so they’ll do a cover story on me, but I don’t want one. I mean, what’re they going to say? Reporters will just rehash. “He lives on the Upper East Side with two dachshunds and he’s a sometimes walking-stick for Paulette Goddard.” Well maybe they’ll feel the same way I do, too, that it’s too boring. I mean you have to do something different like get married and have a couple of kids or take a few drugs or lose a few hundred pounds or die, to be good copy. I was amused beyond words when I read this from Andy Warhol this morning over coffee. As I think of the life he lived, I don’t think of the details he just dropped; I think of an artist who was driven hard by creative endeavors and business decisions during the morning and afternoon hours each day, who then spent every evening chasing parties, nightclubs, gallery openings and headlines. And from my own personal perspective, I find his nightlife boring material for reading, but his art and business affairs I find endlessly fascinating. As a school teacher, I surprise and disappoint some in that I’m almost never seen at school-related extra-curricular events. I go home. And I don’t read long hours in the evening because I feel the compulsion to create better lesson plans (I know that after a quarter-century of teaching, I could enter the classroom with zero preparation); I read long hours in the evening because I love the contemplative life, and have at least since before my years in graduate school. It has become my lifestyle. And currently, my division between thinking and acting is my division between reading and making art. The two dimensions feed off each other. And I would concur with Andy Warhol that my lifestyle would not provide good copy. By today’s standards, it would be judged as boring. However, I am not bored. This holiday season has been bliss-filled because I have been able to devote entire days and evenings to reading, journaling and making art. And I offer no apology for that. We are not on this earth for long. Part of what a midlife crisis is about is figuring out what gives you pleasure and doing more of that in the time you have left without asking for permission or a financial or emotional subsidy from anyone else. Hannah has been excellent company this morning, and she has inspired me to begin a second watercolor, to work on alongside the one I began yesterday. Who knows, tomorrow I may choose to begin a third. It’s great to have some time and space to chase these delights.